Hi folks! Sorry I dropped off the face of the earth/blog! Baby prep plus work deadlines have been overwhelming, and I've kind of been ignoring the computer during my downtime (or else I've been napping). I need to find time to write and schedule a few posts so that this blog won't be entirely dormant when the baby arrives and I'm too tired to do anything! Anyways, the reason for my post is Easter! We took C to the Stations of the Cross for children at our church today, and although she was a bit wiggly and chatty, she did pretty good! She was one of the youngest kids there, and she even got to hold the cross for a while (which she was thrilled about). We've been playing a new Easter-themed board game, which she LOVES. 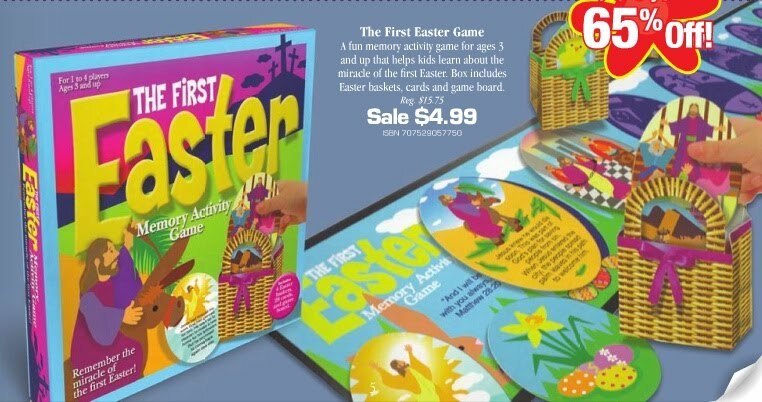 It's a memory-type game called The First Easter. 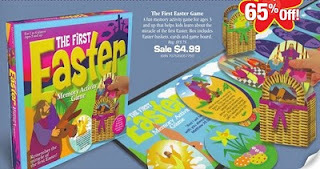 You put egg-shaped cards with the Easter story on them face down, then take turns flipping them over to find a match (just like Memory). When you make a match, one card goes into your Easter basket, and one goes on the game board. Once the Board is filled up, you can read the Easter story together. C got the hang of the game really quickly, and asked to play it five times in a row! I bought it for a fantastic price on sale too! Two printable games I found online have been keeping us busy as well. The first is Easter egg number matching from Confessions of a Homeschooler. It's pretty simple - count the number of dots on half of an egg, and match it with the correct written number. The other game is the chicks in eggs game from Tired, Need Sleep. You fill up plastic Easter eggs with cards showing either a chick or another animal. Roll a coloured dice (included in the PDF), then open the egg. If you have a chick, roll again; if you have another animal, it's the next person's turn. I may print out a few extra non-chicks - we keep getting beaten badly by C! As for music... 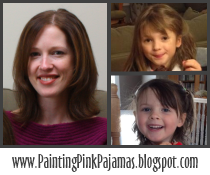 I read about the musician Yancy on the blog Impress Your Kids (now called Oh Amanda) a few weeks ago. I couldn't find her music in my local book and bible store, and tonight I thought to look on eMusic.com - success! 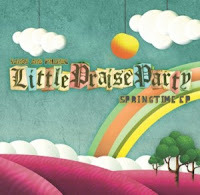 She has a fantastic CD of Christian music for preschoolers, and I downloaded Little Praise Party for my daughter, and then clicked over to her website. On her blog, I noticed that she is offering a 5 song download of new preschool songs for $5 - but only for a limited time - until Easter (edited: this has expired now). "The Springtime Song" is definitely worth a listen at this time of year. It's about a child's view of Easter, reminding them about Jesus. Plus, it's very cute and catchy! We don't have much religious kid's music that we listen to regularly, so I thought this might be a way to introduce some to C.
The weather has been VERY unseasonable and beautiful, and we may have our Easter egg hunt outside for the first time I can remember in my life (usually we still have some snow at this time)! We also plan to make hot cross buns again this year - yum! Glad to see you back! I understand the busy-ness that baby prep brings. I'm just lucky I don't really have any other deadlines to make. I did M's egg hunt this morning (since we are gone all day tomorrow). I love how it worked out! We video'd the whole thing. She loved it, especially when she found out the eggs had things inside them (cheerios, tiny cookies, other cereal, chopped jelly beans, a necklace, choc chips, mini marshmallows... I did 12 eggs). I didn't know how well it would work since she's only 1.5years old, but she took to it very quickly. Lots of fun. I can't wait to teach her the real reason for the season. We'll hear the Easter story tomorrow, which will be great, but I want to find really kid friendly ways to do so eventually. 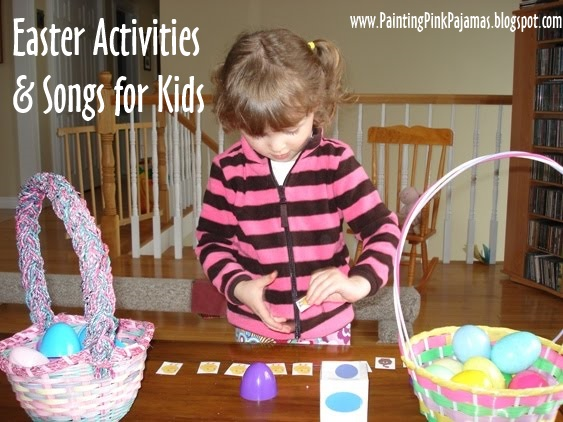 I love all the game ideas you have on here for little ones! Good luck with the baby prep! Thinking of you and the great day that is coming! I hope you are doing well. Just thinking about you today and how you are all getting along. Hope everything went well and you are adjusting to having a newborn in the house, again! My thoughts and prayers are with you. I'm still thinking about you :) Thanks for your comment a while back. I keep you in my reader just in case you start blogging again!